As I wrote last Christmas, workhouse children were often treated to presents and outings over the festive period. This was not the only holiday celebrated by pauper children as the regular outings on Whit Monday (or spring bank holiday) show. 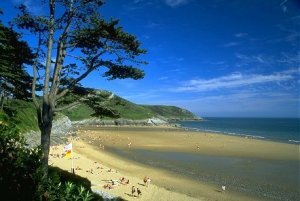 Whitsun was traditionally a time for new clothes and trips and Whit Monday saw Swansea’s workhouse children, children from the Cambrian Institution for the Deaf and the Swansea Blind Institution join up with children from local Sunday Schools to spend the day at one of Swansea’s beaches – Caswell Bay (below) appears to have been a popular choice.